KUALA LUMPUR (Oct 7): The FBM KLCI ended 0.4% lower, dragged down mainly by oil & gas counters on lower crude oil prices. 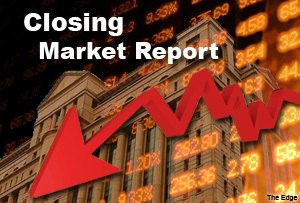 The KLCI lost 7.28 points to end at 1,833.54, as stocks such as SapuraKencana Petroleum Bhd and Petronas Dagangan Bhd declined. In a note, Affin Hwang Investment Bank Bhd said any weakness in the Malaysian stock market was temporary, representing a healthy correction on a larger Bursa uptrend. "While the local equity market could be supported by favourable fourth quarter economic growth and ample liquidity, it should be dragged by falling ringgit on rising foreign outflow as a result of heightened geopolitical risk and uncertainties in the US' interest rate," Affin Hwang said in its market report today. Bursa Malaysia saw 2.19 billion shares worth RM2.08 billion traded. Decliners edged gainers at 804 over 159 while 210 counters remained untraded. Most active counter was Sumatec Resources Bhd. In the region, Hong Kong's Hang Seng Indes gained 0.46%, while Japan's Nikkei 225 dipped 0.67%. According to Reuters, Asian shares rose on Tuesday, while the dollar languished after investors locked in some gains on its recent rally. MSCI's broadest index of Asia-Pacific shares outside Japan was up about 0.3% in late afternoon trade, after wobbling between positive and negative territory as it took its cues from a choppy, losing session on Wall Street overnight.